Retired since 2005. Winters in Phoenix (Peoria); travel all over beyond that. Question: The Park Info section above checks “Big Rig Access” but their web site clearly states a 35-foot maximum. Is the CampgroupReviews data wrong or is the State’s web site outdated? We've stayed here several times before and, while not a great value, it is predictably well-maintained, and reservations are mostly automated. We opted for a back-in site in the "low rent" district. Since this park was designed as an ownership resort for large Class A rigs, interior roads are all paved, and sites are all solid surfaces (various textures and treatments). Backing in was easy in spite of some junk, er, decorations, that the site owners placed right at the corner of the pavement. Utilities are well placed and working well. With the rig parked to allow access to the utilities, parking for the toad on the other side was very tight. Since all the sites are open, we had a strong DirecTV signal. VZW and Sprint were good, but Park Wi-Fi was very weak. 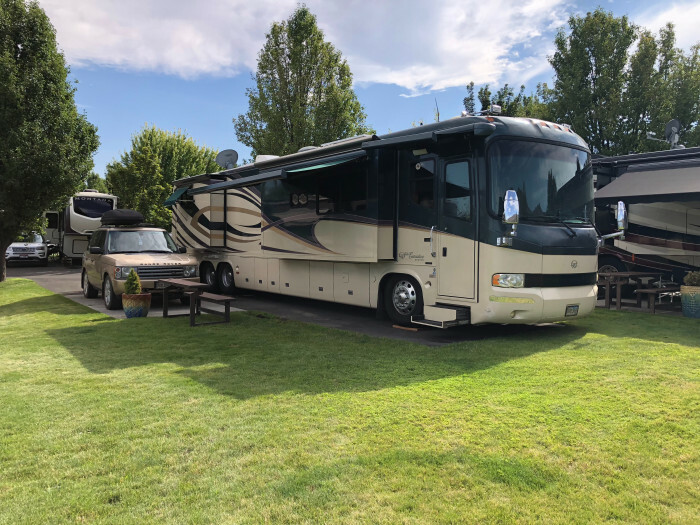 We camped at Pacific Shores Motorcoach Resort (Formerly Outdoor Resorts) in a Motorhome. 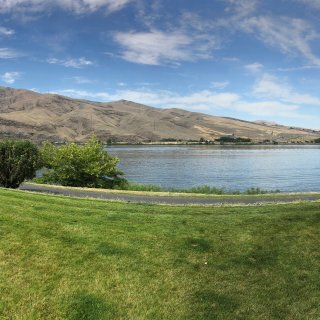 This park offers spacious sites right along the Columbia River. Interior roads are all paved and in fair condition. There are loops on each end that are narrower than the primary roads, which are all one-way meaning many sites have to exit via the narrow loops. Some sites are wide open, and others have shade. Our huge back-in site was half paved and half gravel, an odd combination, but it was surprisingly level once the rear wheels dropped off the pavement onto the gravel. We were completely shaded under a large tree, so were unable to get a DirecTV signal. VZW was good but Park Wi-Fi and Sprint were very weak. This park is popular with locals as well as people traversing I-84, so there were several larger groups using multiple sites partying. Most observed quiet time, though. As we were parked near the main bathhouse, we did have quite a few people walk through our site. The only real problem we had was weak power. The weather was hot (around 100 degrees) and everyone was running air conditioners. Our power dropped from 117-118 volts to 109-110 volts pulling 33-35 amps, almost enough to activate our Progressive EMS for low voltage. With all the Hydro power along the Columbia, this is really inexcusable. We camped at Boardman Marina Park in a Motorhome. Ordnance Brewery offers some good local ales. This park is part of the small Premier Resorts chain. Our "pull in" site was right on the river with a pretty good view. All interior roads and sites are paved, and some have a concrete parking area for tow/toad vehicles. Interior roads are relatively narrow and involve tight turns and, on our visit, there were several areas of low hanging branches that will scratch your rig if you don't swing wide to avoid them (this seemed off because the park is generally well-maintained). 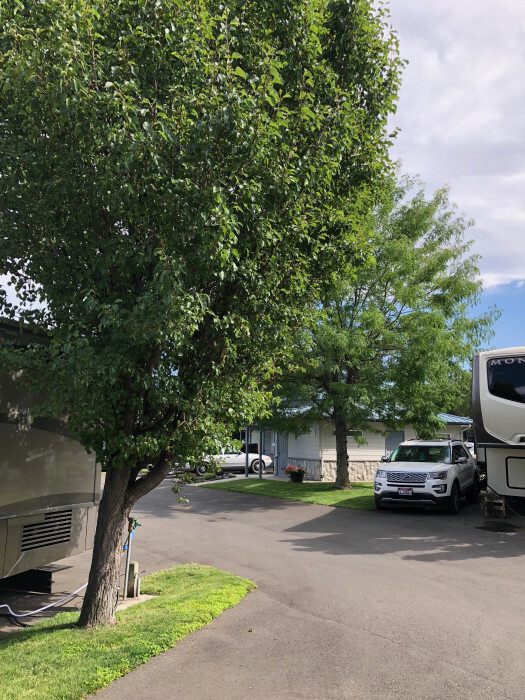 Our angled site was very tight for a big bus to get into because of the close tree and utilities, and rigs/tow vehicles right across the narrow street. We were parked right up against a tree with our slide in the branches. They love their grass here, and over-watering caused it to be a soggy mess when we were there, so we couldn't really enjoy it. 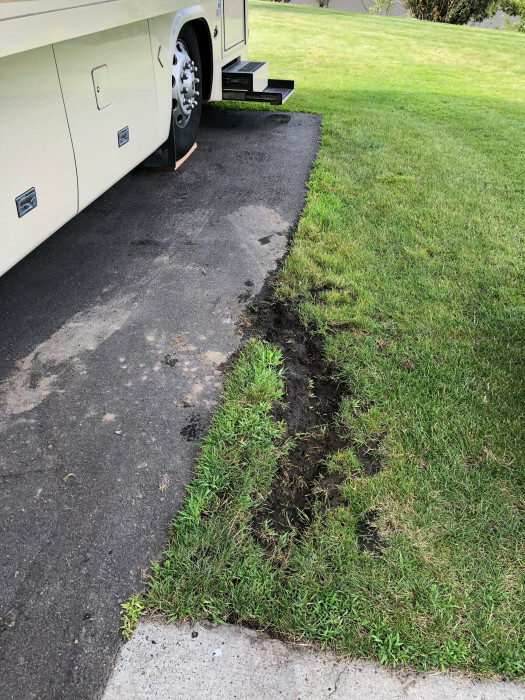 There was a large, wet, muddy area right near our door where a prior occupant had driven off the pavement while trying to maneuver; somebody just pulled the broken picnic table over the mess. Office staff was friendly, even when we went in to mention the muddy mess (and point out that it wasn't us). In spite of the trees, we had good DirecTV access. VZW was strong, Park Wi-Fi was very weak and slow, and Sprint was poor. We had some distant noise from trains that wasn't troubling. The Jet Boats doing tours on the river were much louder but limited to daytime hours. Power was good, as we had two A/Cs running 24/7 due to the heat (over 100 degrees). I would have rated this park higher is it wasn't for the over-watering and lack of tree maintenance. Tight I can work with, but not branches in the middle of my windshield on the interior roads. 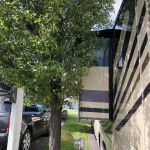 We camped at Granite Lake Premier RV Resort in a Motorhome. This was a one-nighter as we were making a beeline for the Oregon Coast to find cooler weather, and it did well for a quick stay. It has somewhat complicated access from I-90, with some congestion and traffic and the park being almost embedded in a residential area. Staff was friendly and helpful enough. Interior roads are relatively narrow, but we were able to maneuver a big rig through. Our site may have been the widest pull-through we've ever had, with an area almost as big as a second site for parking our toad. Power was good (A/C running full time during the day), Wi-Fi was poor, DirecTV was good, and OTA wasn't available. VZW was good and Sprint was not. There are numerous perma-rigs (long-term residents) but the park boundaries with what looks like an aging trailer park aren't well defined. Like many KOAs, it's tough to say this is a good value given the cost, but reservations via app, discount, and predictability all make things easier. 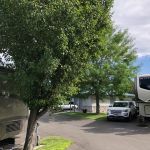 We camped at Missoula KOA in a Motorhome. If you stop in the summer or fall, you can probably get Huckleberry Ice Cream at the evening snack stand. Mmmmmm. 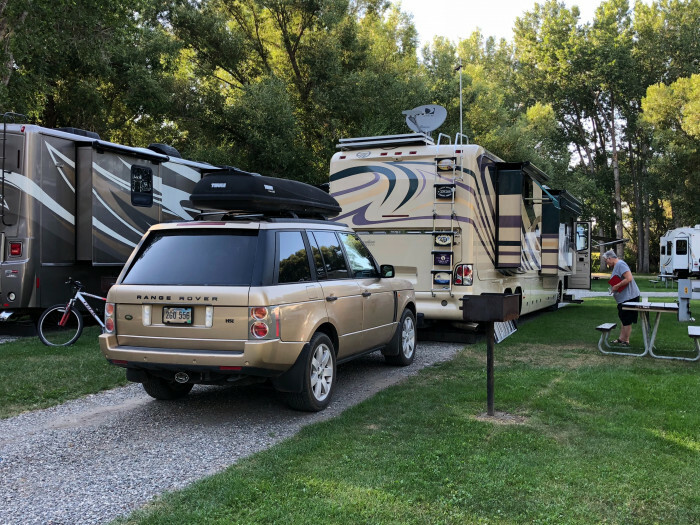 We used this campground as our escape route from the Monaco and FMCA events in Gillette in July of 2018, and it did well for a quick two-night stay. 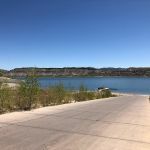 It has relatively easy access from I-90, with some highway and railroad noise. Staff was friendly and helpful enough. Interior roads are relatively tight with some large uneven areas; we were able to carefully maneuver a big rig through. Our site may have been the longest pull-through we've ever had, gravel, and reasonably level but that gravel was literally only as wide as our tire track. We only used the laundry facilities, which were very good and economical. Power was good (A/C running full time during the day), Wi-Fi was poor, DirecTV was wide open, and OTA wasn't available, but VZW was good. There are a few perma-rigs (long-term residents). Like many KOAs, it's tough to say this is a good value given the cost, but reservations via app, discount, and predictability all make things easier. 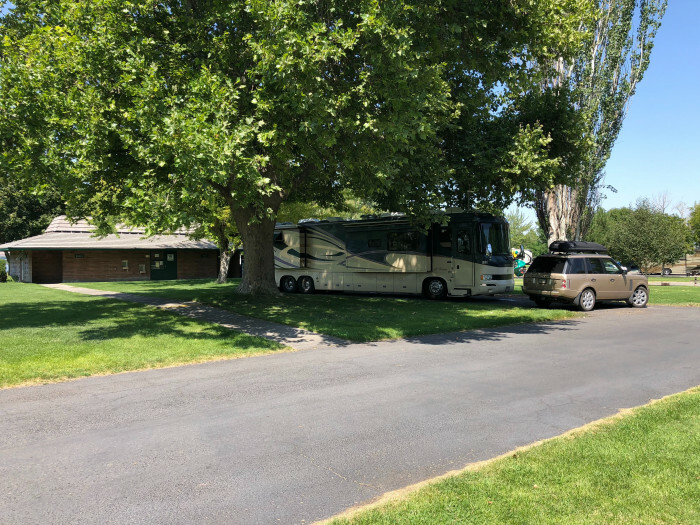 We camped at Big Timber / Greycliff KOA in a Motorhome. 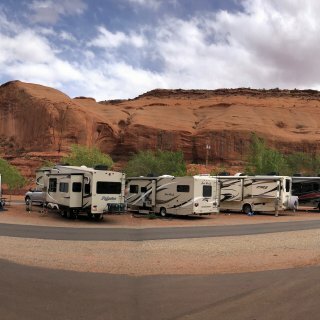 We stayed here for the Monaco and FMCA rallies in July of 2018, so our site cost wasn't broken out separately. 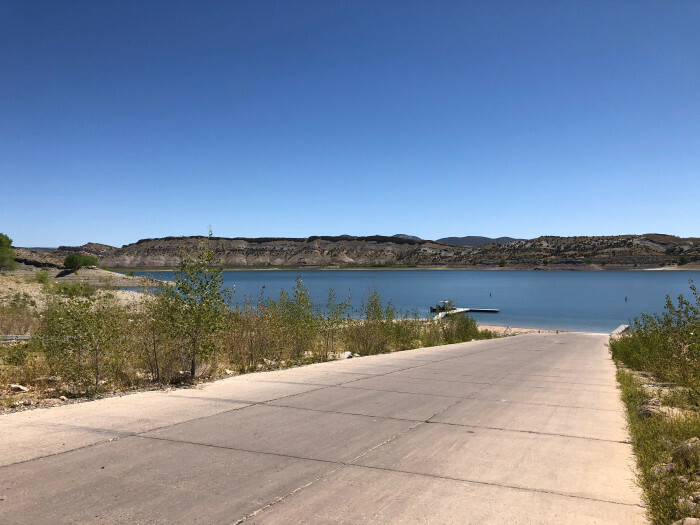 We parked in the "Marquee Lot" with easy access to Garner Lake and Boxelder Roads. This lot is completely 30/50A Full Hook Up sites. Each distribution panel has 4 50A connections and 4 30A. 50A plugs are mounted on the panel frame and 30A cords are nested on the ground under the box. Individual sites do not get access to pedestal breakers. Because of this, your power may be on the "other" side of your rig. We snaked the cord under the rig and did not need an extension cord. It's basically a grass pasture, and deceptively bumpy; drive slowly. We were at the western edge of the lot so thought we'd be more level but still needed over 5 inches of lift in one corner of the rig. Sites closer to the event facilities were much more sloped side-to-side. 50A power was good, although we did have an issue with the 50A distribution breaker tripping at about 32A; Cam-Plex staff were on scene within minutes and had the breaker changed quickly (I was prepared for a "it must be you" speech but was pleasantly surprised). Because it's just a pasture, DirecTV was excellent, as was VZW. There was mention of campus Wi-Fi but we never found it. We had rain that turned the dusty areas to mud temporarily, but everything dried out quickly. As a rally site, this facility is very good (we're used to the sound of industrial generators running 24/7 at large rallies). 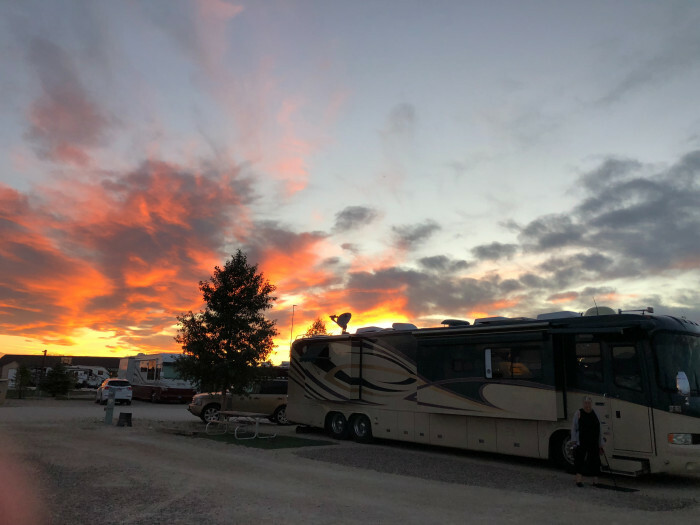 For a short stay passing through, we would definitely stay here again (Boxelder campground hosts individual stays). We camped at Cam-Plex Multi Event Facilities (For Events Use Only) in a Motorhome. 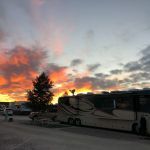 We used this campground as a staging area for the Monaco and FMCA events in Gillette in July of 2018, and it did well for a quick two-night stay. It has relatively easy access from I-25 (we were coming from Casper) and I-90. Staff was friendly and helpful, although the check-in area isn't well defined. Interior roads are relatively tight with some large dips; we were able to carefully maneuver a big rig through. Sites pretty tight, gravel, and reasonably level. We had to back out of our pull-thru site to make our exit turn. There was a concrete "patio area" that was right on top of the next site's sewer hookup. 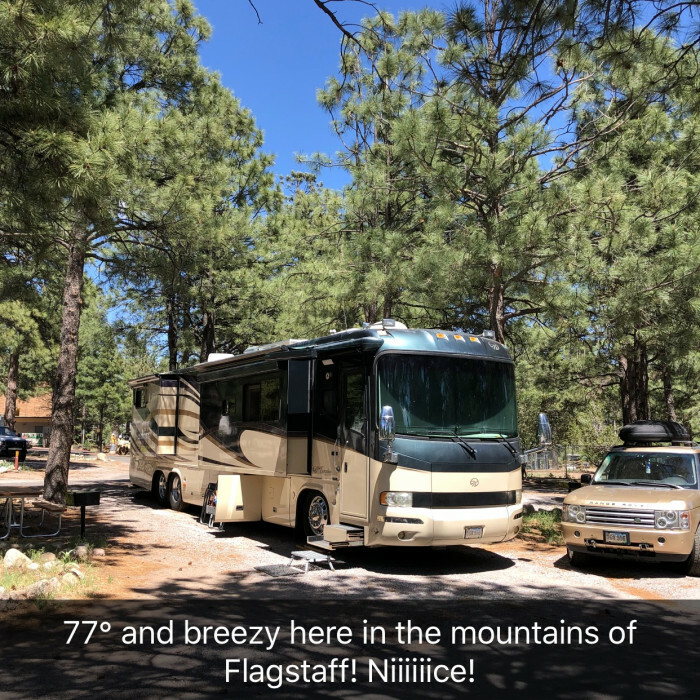 Power was good (A/C running full time), Wi-Fi was fair (not secure, slow in the evenings, and periodic drops when inactive), DirecTV was completely blocked by trees, and OTA wasn't available, but VZW was good. There are not many perma-rigs (long-term residents). Like many KOAs, it's tough to say this is a good value given the cost, but reservations via app, discount, and predictability all make things easier. 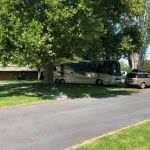 We camped at Buffalo KOA in a Motorhome. We have family in Casper, so we decided to try a couple of different parks. 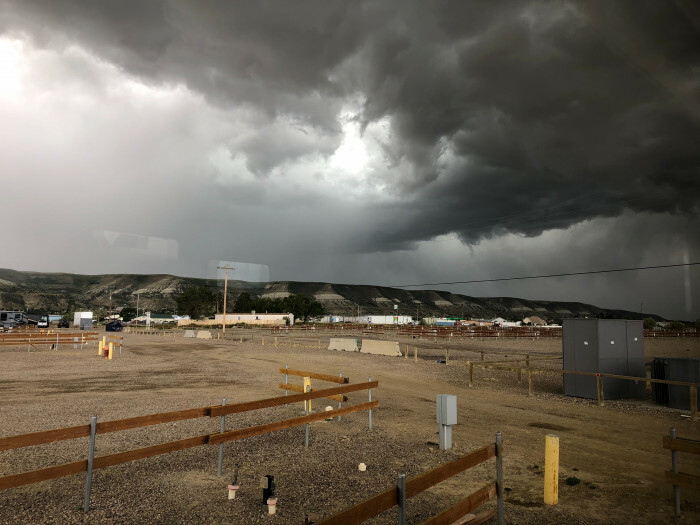 This one is 5 miles north of Casper with relatively easy access from I-25 (watch for the signs for the office; it's all the way to the western edge of the park). Staff was friendly and helpful. Interior roads are all gravel and we were able to maneuver a big rig without issue. Sites were well sized at 60-degree angles, gravel, and pretty level. Power was good, Wi-Fi was good (not secure and periodic drops when inactive), DirecTV and OTA were good, and VZW was good. There are not many perma-rigs (long-term residents). 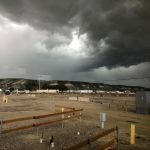 We were here over Independence Day and had a great view of the fireworks from the Casper Events Center by simply walking across the street with our folding chairs. 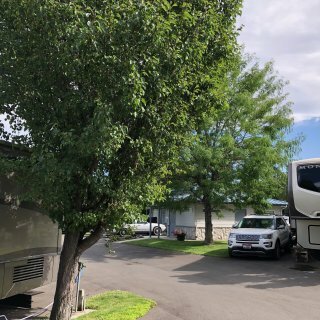 We camped at Casper KOA in a Motorhome. The Hanger restaurant behind the park is an interesting and kid-friendly place to eat, and learn about the history of the town as an airport (yes, the streets were once runways and taxiways). The pizza place behind the park is a biker bar that tolerates some pretty rough language. We have family in Casper, so we decided to try a couple of different parks. This one is 5 miles east of Casper with relatively easy access from I-25 (if you cross the Platte River bridge, you've gone too far). The manager/owner was friendly and helpful; watch for limited office hours. Interior roads are all gravel and we were able to maneuver a big rig without issue. Sites were well sized at 60-degree angles, gravel, and pretty level. Power was good, Wi-Fi was excellent (but unsecured), DirecTV and OTA were good, and VZW was strong. There are quite a few perma-rigs (long-term residents) and some associated noise/traffic, but that is to be expected these days in this type of area. We camped at River's Edge RV & Cabins Resort in a Motorhome. We have family in Casper, so we decided to try a couple of different parks. This one is 20 miles east of Casper with relatively easy access from I-25. Staff were friendly and helpful. Interior roads are all gravel and we were able to maneuver a big rig without issue. There was some mud in the park after recent storms, but maintenance staff was spreading fresh gravel and grading periodically. Sites were well sized at 90-degree angles, gravel, and pretty level. Power was good, WiFi was excellent (but unsecured), DirecTV and OTA were good, and Verizon was surprisingly strong for a rural setting. 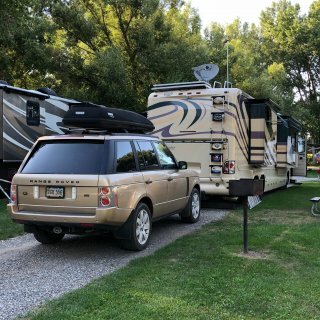 We camped at Platte River RV & Campground in a Motorhome. Ayres Natural Bridge Park is near Douglas, only a few miles east of this park. Pack a picnic lunch and plan to spend a couple of hours relaxing by the stone arch and flowing river. While an older park, the facilities for a short stay in the area were pretty good. We had a very long full-hook-up with good utilities and placement. We had excellent DirecTV, VZW, and OTA service and park Wi-Fi was very fast and uncongested (although not secured). Recent rains left a little mud in places, but it dried up quickly. 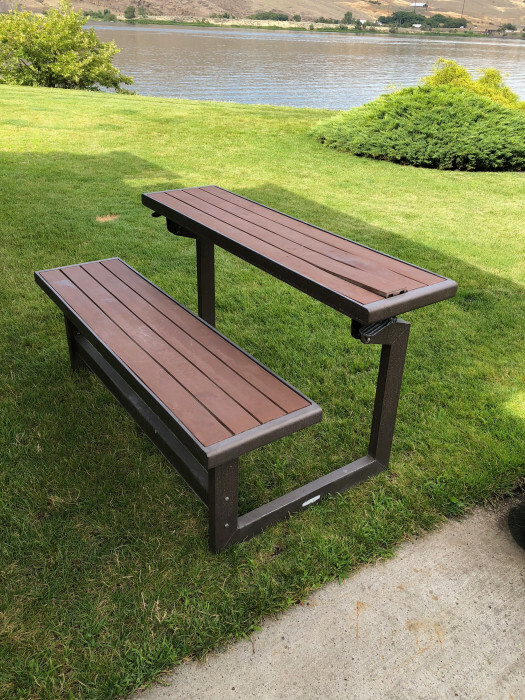 The shared outside space (every other rig facing the opposite direction) is a little dated but that's offset by the long and angled sites, as your "neighbor" isn't right next to you. 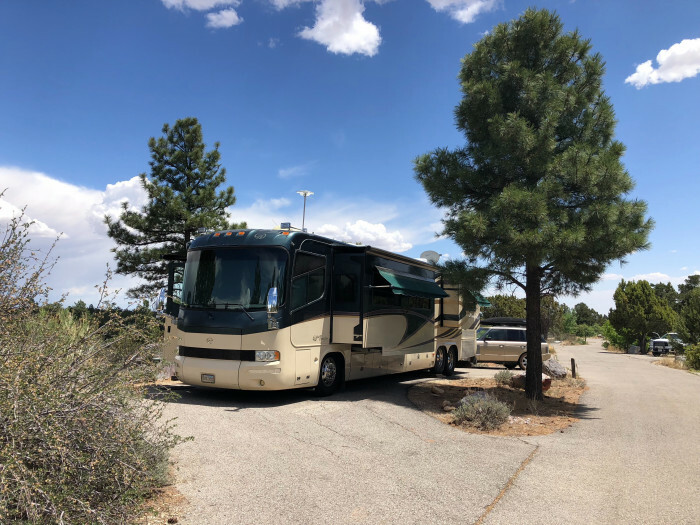 We camped at Wind River RV Park in a Motorhome. This is a huge facility with a large number of sites. It's basically a large series of open areas covered in crushed rock with wooden fencing to mark off spots. Their web site has excellent information on events that might increase usage, but call ahead if unsure. Each row of sites has a strip behind it where service hook-ups are located, so extra cord and hose may be needed. 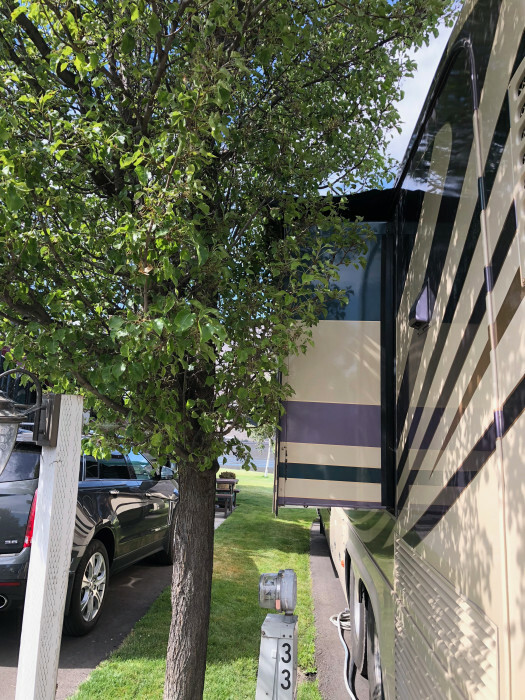 We were able to get an end spot which was a little wider, allowing us to "parallel park" and get easier access to the full hook-up connections. Our site was surprisingly level, considering that the whole facility is on sloping land. When we stayed, there weren't a lot of activities going on, but we did hear some noise from other parts of the grounds at times during the day. Enter at the "livestock" gate and look for the host about halfway in on the left. Other than full hook-ups, there aren't many more amenities but that's OK! We were able to get excellent DirecTV access, good VZW coverage and weak OTA signals. 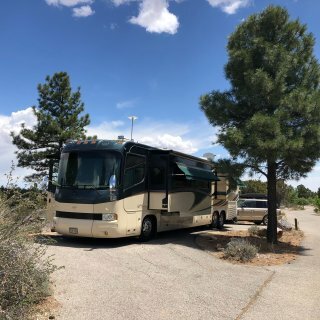 We camped at Sweetwater Events Complex - RV Park (formerly Sweetwater Fairgrounds) in a Motorhome. 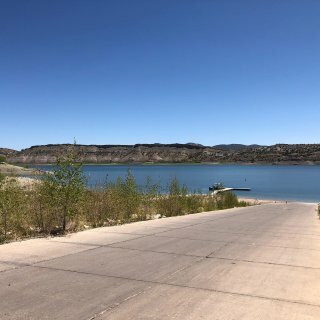 This park is on an irrigation reservoir and has a variety of site types and sizes, so research carefully and use Google Earth. Elevation varies across the park, so some sites are up high and others are in a hollow. Sites 1-8 or 9 were the only full hook-ups when we stayed. 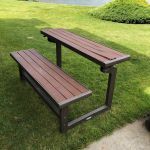 All the sites and interior roads are paved with concrete patio pads and picnic tables. 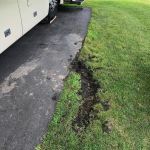 Sites are either back-in or the semi-circle style of pull-thru, and large rocks and tough bushes are strategically placed to jump out at your rig while parking if not careful; use a spotter. Some tree branches over roads really needed trimming when we were there. Our pull-thru was long enough for our large motorhome and toad, and surprisingly level in the middle just where we needed to park. We did have to wait several hours after check-in to set up, as hosts didn't want to bother the prior occupants who were locals in no hurry to vacate. We were high enough to get good DirecTV and OTA coverage, but just too far away from civilization to get a decent VZW signal (it worked at the boat launch). Flies were an issue throughout the park, and especially near the pit toilets and fish cleaning station by the boat launch. 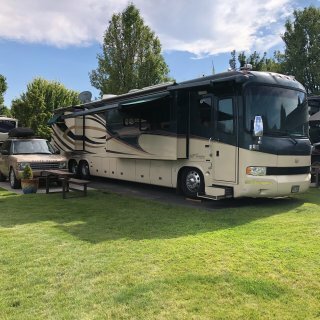 We camped at Steinaker State Park Campground in a Motorhome. Sites and interior roads are gravel and dirt, so dust and dirt can be an issue. Trees aren't numerous and didn't interfere. Our site had a tree, but we were still able to get DirecTV. Sites in our area were generally level and angled for easy pull-thru access. Park Wi-Fi was decent, with minimal slowdowns at peak periods. We got a good VZW signal. OTA TV access was excellent. Good power (no real voltage drops at peak times) and decent laundry. Not the best value in town, especially when compared to the State Park a mile away; basically a big gravel lot with hookups. The only issue we experienced was a difference in pricing from what we reserved at koa.com. It was clear that they changed their rates (I went back to the confirmation emails and screen shots at reservation time) but they insisted it was due to changes in sales taxes (not likely since it was exactly $2/night). In the end, they made an adjustment and credited me for about half of the overcharge but left me with the feeling that the discrepancy was all my fault and I was trying to scam them. I've never had this happen at another KOA. We camped at Green River KOA in a Motorhome.